I had the pleasure of climbing in Italy during the first weekend of September. I had made arrangements with Paolo who I had met during the trad climb meeting in Valle Orco last year. Our original plan was to do the Cassin on Piz Badile, but the weather did not seem to agree with this plan so we switched our objective to the Dolomites. 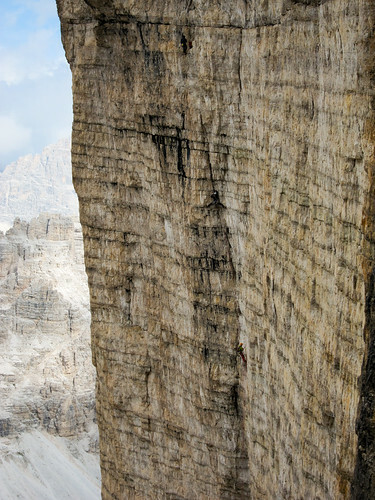 The Comici route is one of the six classic north faces in the Alps and almost the symbol for climbing in the Dolomites. 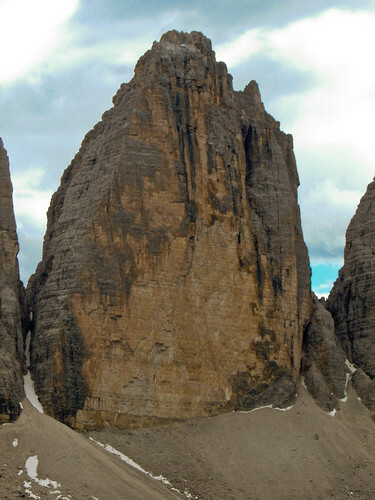 It was climbed first in 1933 by the extremely talented Italian climber Emilio Comici. The route is overhanging for the first part and is really sustained for the first 7 pitches. After this it eases off to vertical, but it is still quite demanding even if the technical grade is not so high. Paolo leading the first grade VII crux. 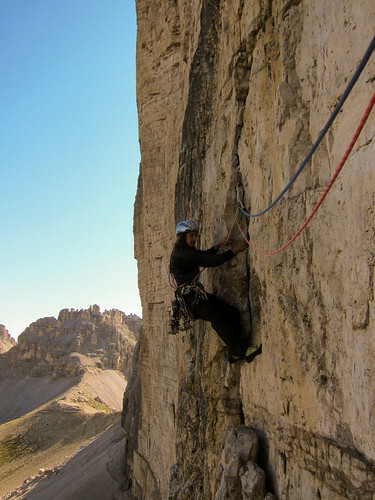 We found the climbing very enjoyable and the rock is actually really good when you compare it to some of the choss that is often found the Dolomites. The protection is a mix of self placed gear and old pitons. It generally protects well. We managed to free climb most of the sustained first part, but we had to climb A0 and pull on the pegs in the soaked-up chimneys higher up. This was rather a dirty wet job that probably delayed us for 1-2 hours. 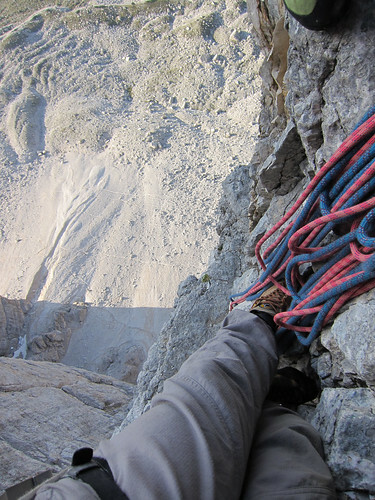 A look from the Comici into the neighbouring Hasse/Brandler which theese days are a free climbing test piece. You can try to spot the climbers in the photo! A serious dose of exposure. This is actually one of the better belays on the face. 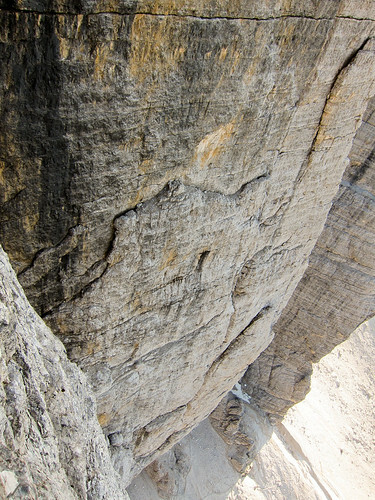 A look down the face we just climbed with only two easy pitches to go. 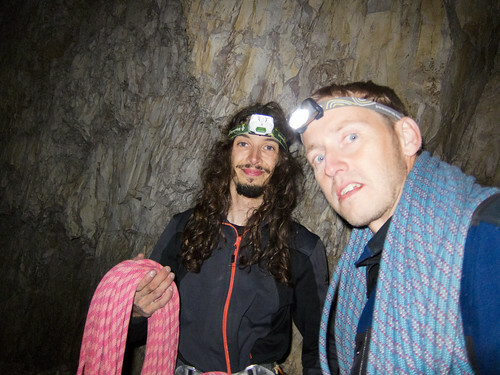 We arrived at the spot after a very airy traverse, where we had to exit a wet cave. About nine hours after starting out we found ourselves at the ring band terrace, just below the summit. We wanted to go down immediately before dark, but we failed to find the descent and soon we where wandering around in the dark. The descent took longer than expected, but after a series of scary abseils we where back on terra firma. Back on the ground at night after getting a good scare. A perfect day on a classic alpine north face.